To schedule an appointment call us on 662 3744 (working days 8-18.00). We will certainly find you a suitable time. To discover possible haemorrhage or blockage sites of blood vessels in the eye. Your pupils will be dilated and prior to having the angiography normal photographs will be taken of the back of the eye. Dye will be injected into your bloodstream through either your forearm or the back of your hand. Approximately 15 seconds after the injection the dye will reach the blood vessels in the back of your eye. With a special camera the journey of the dye will be recorded and monitored. This procedure will take approximately 1 hour. Please inform us in regards to any allergies and all the medications that you are currently taking. This procedure requires pupil dilation so your vision will be distorted for 1 hour during which you should avoid driving a motor vehicle. Measuring the internal pressure of your eye. Nerve damage may be caused by increased pressure. Over time this may lead to reduction in your vision. The test will be conducted with a special pressure measuring apparatus called a tonometer. The patient will rest their chin on a special ledge and the tonometer will lightly blow air into their eye. The tonometer will record all data. We will start with dilating your pupils to make the retina more visible. Once the pupils are dilated the patient will place their chin on a special apparatus in front of a camera. Every picture taken will be visible as a bright flash. . Multiple pictures may be necessary for accuracy. The duration is dependent on how long it take for the pupils to fully dilate. Photos usually only take a couple of minutes, however the whole process may take up to 40 minutes. Due to the necessity of pupil dilation your vision will be disturbed for 1-3 hours after the procedure. Before your vision has fully restored you should not drive. Structural analyses of the optic nerve. In open-angle glaucoma, even though the drainage angle is “open”, the fluid passes too slowly through the meshwork drain. Since the fluid builds up, the pressure inside the eye rises to a level that may damage the optic nerve. The Heidelberg Retina Tomography uses scanning laser tomography to produce 3- dimensional images, witch allow precise measurements of optic nerve head parameters. This technology enables to differentiate between normal eyes and glaucomatous eyes even before visual field defects are present It also allows for accurate comparison on follow-up examination. If the test is performed for the first time, additional information is needed. We measure the radius of the eyeball and if the patient wears glasses for distance vision we also measure/ check them. The patient will look at the cameras lens and will see a bright red spot. The spot will vibrate during scanning which will take a few seconds. The test will take about 20 minutes. In some, more difficult cases, a little longer. To measure thickness of the optic nerve fibers. Increased pressure within the eye may cause damage to the nerve fibers or reduce them in diameter. This may result in reduction of eye sensitivity because the data transfer is disturbed. The patient will look at the cameras lens and see little spots flashing on a bright red background. Photographs will be taken of both eyes and they will be compared to normal visual reactions in the machines database. This will help determine if the reaction is normal or not. With repetitive examination change can also be monitored. To receive a cross sectional image through the retina or cornea. The machine will scan the reflection from the different layers of tissue and will compose a cross sectional image. That way we can see any possible damaged areas in the retina and any other anomalies that are otherwise extremely hard to locate. The patient will place their chin on a special support structure and will look at a blue dot on the lens of the machine. Depending on the required information multiple images may be taken. In most cases the images will be compared with the database from the machine to more effectively spot any anomalies. Images can be taken over time to monitor the progression of the pathology. On average the scan takes about 5 minutes. If the image is distorted the procedure may take longer. Pachymetry must be conducted to measure thickness of the cornea. 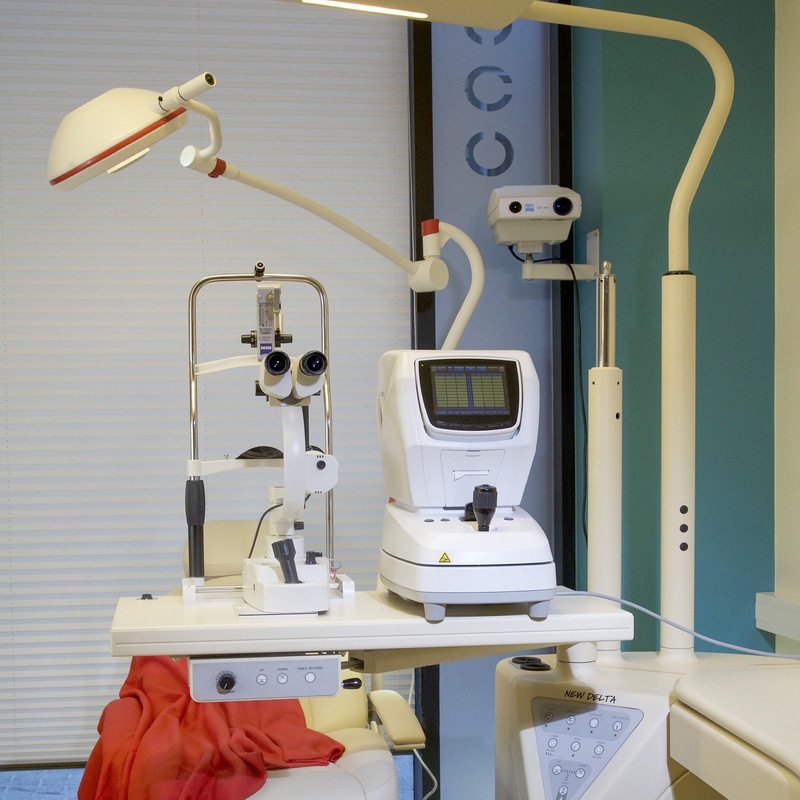 The eye is numbed with a special fluid and then measured with a specialized tool. For accuracy multiple tries may be necessary. Taking the measurement takes a couple of minutes and the results can be printed. Perimetry helps evaluate sensitivity of the eyes and the scope of peripheral vision. It is mainly designed to assess the magnitude of damage done to the deep nerve fibers in people with glaucoma but it may also be used with alternative problems. There are multiple tests to assess ones visual field and the physician will assign you with the one most appropriate for you. The patient will rest their chin on a special support and look at flashing lights on a screen. The flashes may be of different intensities and will appear in different places in your visual perimeter. When the patient sees a flash they must record it by pressing a button. The machine will check different spots multiple times to correct for error. You may wear your contact lenses during the test but if other examinations have been scheduled for the same day we recommend that you wear spectacles instead. If you use reading glasses please bring them with you.